Our popular foam core product is lightweight, easily cut and manipulated material used for photographic print mounting. 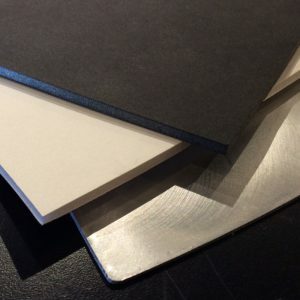 Foam core is comprised of three essential layers: the inner layer is made of polystyrene foam clad, with the two outer layers made of white clay coated paper. The board is commonly used as a backer for print durability and framing, to enable a smooth surface appearance and sturdy, upright display option. In mounting, a press-sensitive adhesive is applied to the surface of the foam core so that denting, bubbles or any other imperfections are hiding from the surface view. Contact our customer service team today to discuss available dry mounting options for your fine art photographic prints. Our team is here to serve you at (970) 381-3421, or via email at plaqit@duraplaq.com.